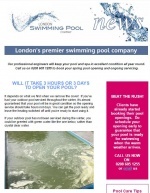 Would you like to receive details of special offers and tips for caring for your swimming pool and spa delivered directly to your mailbox? If so, please sign-up for LSPC News now. You can also download back issues of newsletters here. If you are an outdoor pool owner, a priority will be opening your pool early, so you don’t miss a moment’s swimming when the sun smiles at us again! 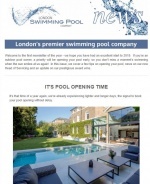 In this issue, we cover a few tips on opening your pool, news on our new Head of Servicing and an update on our prestigious award wins. As autumn approaches, we offer timely advice on closing outdoor pools for winter to ensure it's in perfect condition when you re-open it in spring. 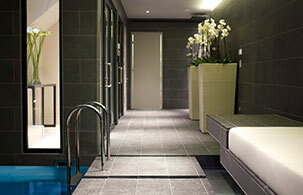 For our indoor pool clients, there’s news on our innovative Pool Rental Programme with our partner Sports Generation. 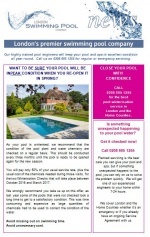 The programme allows pool owners to earn money when the pool is not being used! Along with our usual pool servicing news and advice, we bring you three offers until 30 April 2018. 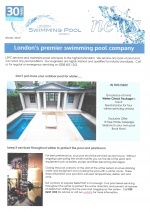 The offers include discounts on our range of pool chemicals, solar covers and pool liners. You can also learn about the amazing Activated Filter Media (AFM) which provides superior water clarity. 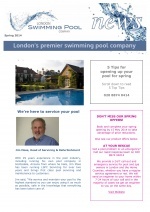 This issue covers early spring opening, tips on pool care, hint of a forthcoming campaign to get more children swimming, details of our Pool Star of the Year and more. Keeping your pool serviced throughout the winter will ensure that your pool is in perfect condition when you re-open it next spring. 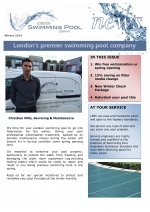 Take advantage of our Winterisation Check offer which is launched in this issue. And enjoy reading our latest news. Is your home in London or the Home Counties? If so, we're offering 10% reduction on the chemicals needed to service your pool and get it open in time for the first signs of sunshine. Call our servicing department (020 8605 1255) and quote LSPC/March16 Opening to book this special offer - ends 30 April 2016. We're also offering a free Filter Healthcheck - all year round. And we've introduced a new advanced glass media which outperforms existing filter media. To find out more call us on 020 8605 1255. 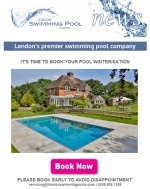 Winter pool check offer and free Watsu massage in your own pool. 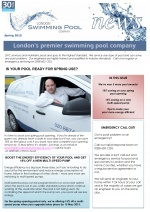 Special offers on spring pool openings and new multi-speed pumps, news on our award wins and tips to make your pool more energy efficient. A South West Londoner is the lucky winner of our 30th Anniversary prize-draw - they will receive a spring pool opening worth £300 come April 2015. Congratulations! 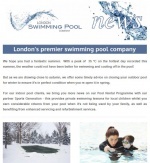 News and special offers for spring 2014.